Try our stock market for beginner's money management software to build yourself a perfect investment portfolio - a mix of stocks, bonds and other investment products. Portfolio Builder was designed to help you build perfect investment portfolio, according to your unique saving goals, yields expectations, risk tolerance and time horizon. You only have to answer eight simple questions and click the button 'Build Portfolio Now'. 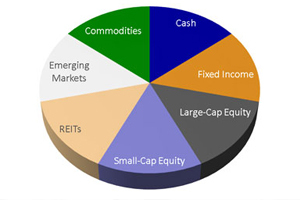 You can expect strategic asset allocation as a result. Please, be aware, that our money management software - 'Portfolio Builder' can only produce good results if all the necessary data is entered in the system. It is essential to have a clear understanding of your financial situation to provide you with investment advice in the most effective way. This may include understanding your personal (sensitive) data, such as current financial situation, consolidated wealth, as well as your investment horizon and appetite for risk. 1. What time horizon would you be comfortable with when investing? 2. What is your saving goal? 3. Which of these portfolios would you prefer to hold for the period of one year? Move your mouse over the image and click on it to select appropriate choice. If you change your mind after selection, you can RESET the answer. 4. 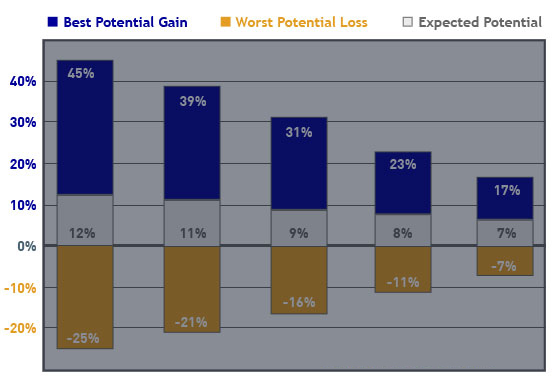 How long you are willing to tolerate a negative return on a portfolio before you will decide to dispose the investment? 5. Which volatility pattern are you most comfortable with? 7. Are you an experienced investor? By entering your email address you will subscribe to FREE Stocks-For-Beginners.com newsletter, where you can find useful information regarding stock market investing. If you would like to unsubscribe, you can do it anytime by a single click in the email received.